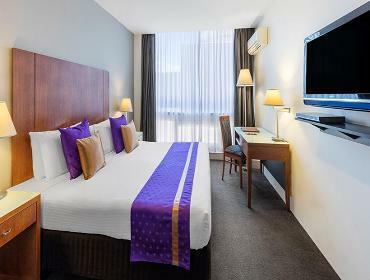 Park Regis Griffin Suites is situated in a fantastic position between Melbourne’s city centre and popular St Kilda Beach with Chapel St nearby. With its spacious and stylish studio, one and two bedroom apartments offering modern interiors, comfort and privacy, the hotel provides a relaxing home away from home. 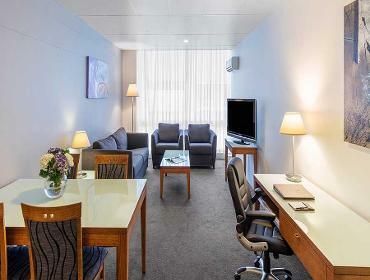 After a busy day of sightseeing or business meetings, unwind in your apartment with full kitchen facilities (kitchenette facilities in hotel rooms/studios), free cable TV, DVD player, WiFi (fee) and reverse cycle air-conditioning/heating. The hotel’s onsite Purple Cafe/Bar is the perfect option to grab a delicious breakfast, fresh tea and coffee or lunch – or just a quick snack or sneaky treat. Take a step outside the hotel (if you must!) and you will find an endless choice of restaurants and cafes – just moments away. 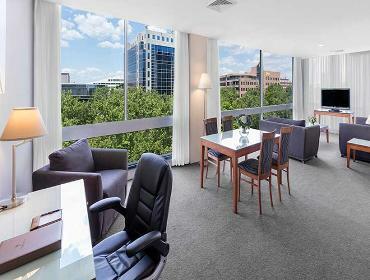 Park Regis Griffin Suites offers onsite function space for all small to medium sized events. Or for a more unique affair – we offer Purple Cafe/Bar for exclusive hire – the perfect place to hold a cocktail function! 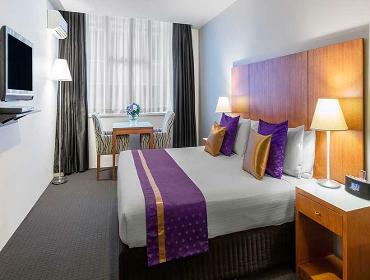 Conveniently located on St Kilda Road with a tram stop directly opposite the hotel, Park Regis Griffin Suites is the perfect choice for guests who need to be in easy reach of all that Melbourne and its surrounds have to offer. Close to Albert Park in St Kilda Road’s business precinct, it’s also just minutes from the National Gallery of Victoria, Melbourne Theatre Company, Sidney Myer Music Bowl, Royal Botanic Gardens, Crown Casino, MCG, Chapel Street and popular restaurants and cafes. Park Regis Griffin Suites also provides guests with 24 hour Reception on Fridays & Saturdays and 5am to 12midnight Sundays through to Thursdays. Other facilities and guest services include onsite Purple café and bar, laundry service, Wi-Fi, tour bookings, luggage storage and undercover parking. For meetings and event, the hotel offers meeting and function facilities catering for a range of events. 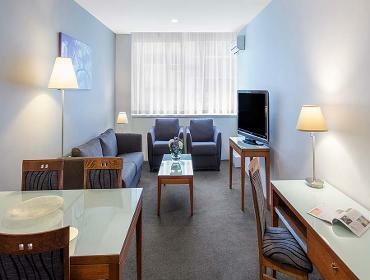 For business or pleasure, Park Regis Griffin Suites is the ideal central base in Melbourne.